While woodworking is a passion and hobby of all the members of Pixel & Timber, we don't get to create mass-production furniture pieces for clients as much as we'd like — this project was a welcome exception. Our Co-Founder, Brandon Leedy was tasked by Frontgate Home Furnishings to design and develop a series of home office accent furnishings inspired by the clean, compact aesthetics of campaign furniture. The team at FG Design sought to implement device charging and laptop technology into a series of wood furnishings that didn't feel out of place in a users home office. The typical FG customer has an office in a traditional, lavish wooden aesthetic — with furnishings that are intentional and sturdy, but aren't quite built for our modern devices. These new pieces were intended to bridge the technology gap, sitting on top of a traditional wooden desk, side table, or cabinet. Campaign furniture is reinforced on its corners and edges with beautiful brass supports to increase durability and stabilize joinery as humidity and temperature changes over the year. 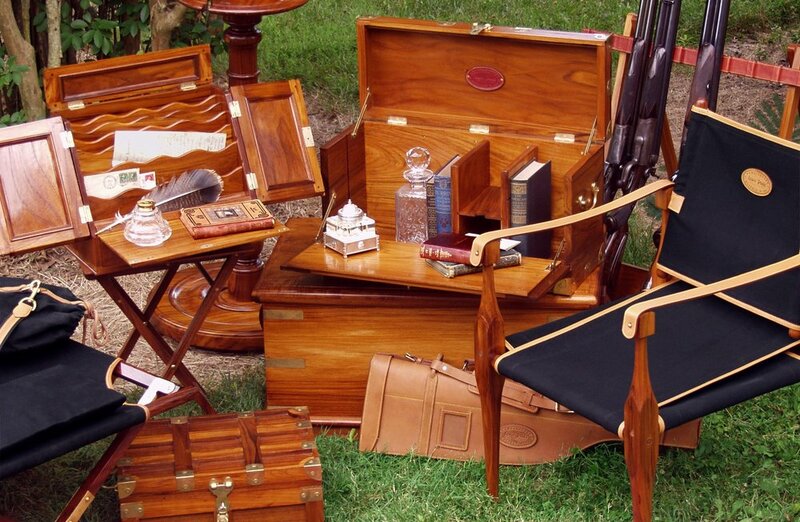 Additionally, campaign furniture is known for its ability to fold-up and conceal its pockets and features for easier transport. This nod to mobility seemed a natural choice for tech-integrated pieces. 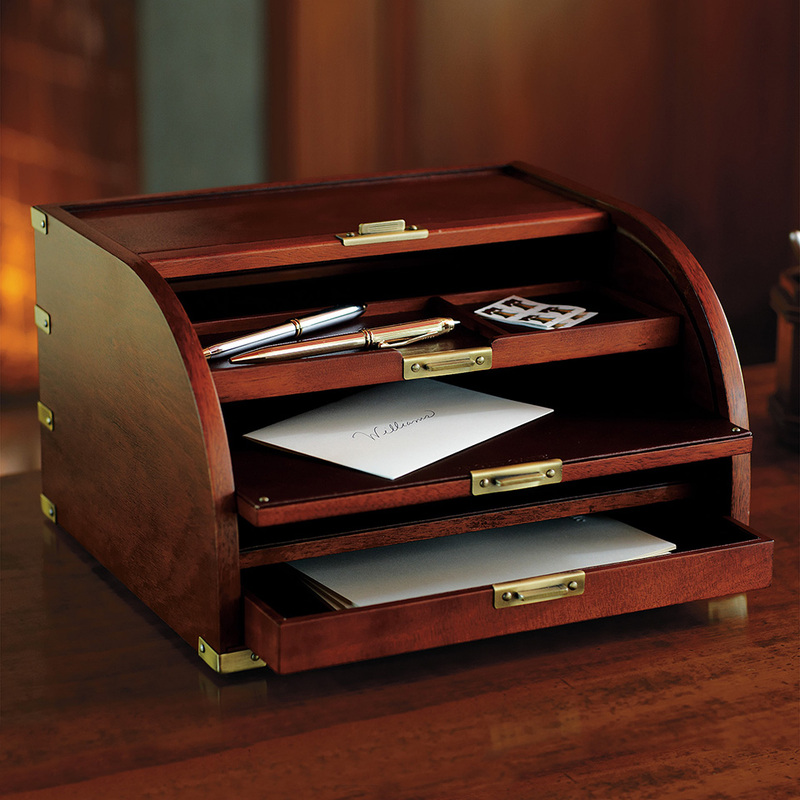 A classic banker's desk with a rolltop, tambour closure was too iconic to pass up, and we had to bring this design detail of the era forward. Sketching around the pieces began with an in-person brainstorm with the FG team of designers and buyers. During this brainstorm, team members pulled thumbnail imagery of classic campaign furniture to inspire features and design details. This greatly helped supplement sketches in the moment, creating common language among designers and non-designers. Lots of options were generated to move into formal sketching and renders. 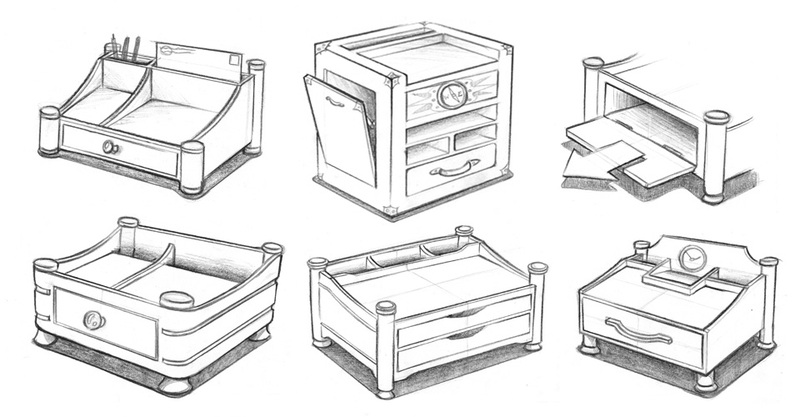 Thanks to Brandon's experience with woodworking joinery and a great grasp of the final detail intent by the team during the brainstorm, the sketches were closely reflective of the final product. The formal concepts were developed into simple CAD-based tech packs to clearly communicate joinery, material selection, and accent details to the overseas manufacturer.